Waiter, there's some Velveeta and ketchup in my soup!? Shares of Campbell Soup rose more than 10% Monday following a report in the New York Post that said Kraft Heinz is "very interested" in trying to buy the company. Food giant General Mills was also cited by the New York Post as a possible suitor. Campbell Soup (CPB) has been under fire from investors lately. Soup sales have slumped and a push into fresh and organic food hasn't panned out as well as hoped. The company also recently spent more than $6 billion to buy snack food company Synder's-Lance. Despite that deal, Campbell Soup said in May that its outlook for the rest of the year wouldn't be as good as expected. Longtime Campbell Soup CEO Denise Morrison also abruptly retired in May. And Campbell Soup hinted that parts of its business -- or even the whole company -- could be for sale. A spokesman for Campbell Soup told CNNMoney Monday that a "review is underway," but that he would not speculate on its outcome or comment on any takeover rumors. Campbell Soup may need to pair up with another food company to stay competitive. The stock is still down 12% this year and nearly 25% over the past 12 months, even after Monday's big pop. And it's not the only struggling food company. Shares of ConAgra (CAG), Kellogg (K) and Oreo and Cadbury owner Mondelez (MDLZ) all lagged the S&P 500 during the past year. So has Kraft Heinz (KHC). The company was formed when Kraft bought Heinz in 2015, and it counts Warren Buffett's Berkshire Hathaway (BRKB) and private equity giant 3G as its two biggest investors. Packaged food companies have been increasingly pressured to cut prices because of the rise of Amazon (AMZN)'s grocery businesses, which include Whole Foods and the AmazonFresh Delivery service. Walmart (WMT) and Costco (COST) -- two other retailers known for keeping prices low -- are also big players in the grocery business. Even supermarket king Kroger (KR), which also owns the Ralphs and Harris Teeter chains, has recently found success by cutting prices. All of that is bad news for the big food companies -- and it is a key reason why there have been more rumors about food mergers. Kraft Heinz has reportedly been looking for another deal since it abandoned a plan to buy European food and beauty products conglomerate Unilever (UL) last year. A spokesman for Kraft Heinz had no comment about the Campbell Soup chatter. But shares of Kraft Heinz have been pummeled this year, falling 17%. General Mills (GIS), most well-known for its many cereal brands, was not immediately available for comment about its reported interest in Campbell Soup. But General Mils has already been actively making acquisitions to try and boost sales. It bought pet food company Blue Buffalo for $8 billion earlier this year. Wall Street remains skeptical that deal will help get General Mills back on track though. Its stock is down more than 20% so far in 2018. Still, the big food companies continue to gobble up smaller, niche companies in order to find new growth opportunities. Candy king Hershey (HSY), which successfully fended off a hostile takeover from Mondelez, has bought a trio of companies in the past few years. It snapped up Amplify Snack Brands, the maker of SkinnyPop; Ripple Brand Collective, owner of BarkThins; and jerky maker Krave Pure Foods. ConAgra acquired Boomchickapop parent company Angie's Artisan Treats last September while Kellogg gobbled up Chicago Bar, the owner of the RXBar protein bar, in October. These have all been relatively small deals though. 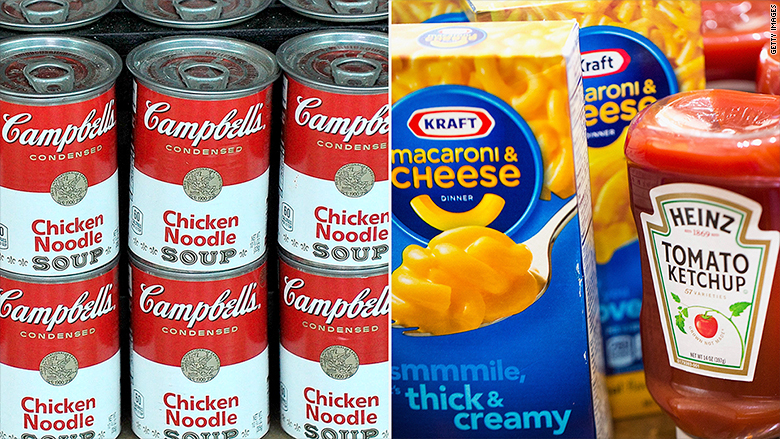 Will a big food company want to buy something as big as Campbell Soup? Despite its troubles, it is still worth nearly $13 billion. That means it won't be an easy, or cheap, deal to digest.